1.1. What does Movibeta do? 1.2. Why should I choose Movibeta? Movibeta is a film submission and distribution system through internet. Good service and direct contact. Higher visibility and media campaign for the festival. Free service for the film festival as long as the directors are paying. The film festival may pay for the service and will be free for the director in this case. We adjust to film festival requirements. Film information can be adjust to each film festival, and can be downloaded from the film festival. Editable subtitles and excellent Film quality. Easy used to mark the ones that you already watched, need to review, dismish. You can ask for copies of digital projections without a data limit although limitations due to the director´s internet connection still apply. There are no additional costs. You can see the festivals that have already evaluated your film. Responses from info@movibeta.com are fast and helpful. We facilitate communication between directors and the festivals we work with. Fill in your film information only once. The number of film festival that do not requiere additional film information keep increasing. Each submission is valid for one film festival. You may submit as many films as you have that meet the festival requirements. Short and feature cost the same. Your packages do not expire. You can send your HD quality copy for screening through Movibeta without any further payment. 2.1. ¿Who pays? ¿How much does it cost? 2.2. I have more than one film. Can I submit them to a film festival for the same price? 2.3. How can I get an invoice? Payment is done by the participant. Each submission is spent for each film festival and you may submit as many films as you want as long as they adjust to film festival requirements. Sometimes, festivals pay to have the service free for the participants. The "AdmissionFee" is a unique charge that The Festival collects to every film that participates check terms and conditions. If you are taking part in a Festival that has "AdmissionFee" you will be move on to "Paypal" to pay the amount. That amount will not affect to your Movibeta credits. We do have accounts and special fares for distributors, producers and film school it may be convinient if you have more than 3 movies. Prices starts at 90€ yearly. If you have more than 3 films write us to info@movibeta.com. If film festival bases allows you to submit more than one film, it is ok with us, and you will not be asked to pay more, just one sending will be spent. Contact us to info@movibeta.com if you have any issue. 3.1. I do have a festival, I want to work with Movibeta, what do I need? 1. 1. Inform in their terms and conditions about Movibeta as an option to do the submission. It may be the only method or there might be some others (Film festival may use as well DVDs, links, or other platfforms)	The festival must indicate clearly at their regulation that participants submitting through Movibeta shall not send hard copies per postal service, and the film information at Movibeta will be the one used. 2. Inform participants about finalists - projected - selected movies. We can help you with that. 4. Include one of our banners in the Festival's Home. You will have to send a mail to info@movibeta.com providing the following information: Film festival bases or term and conditions, type of festival, logo, dates of opening and closure of submissions. Files visible in streaming will be valuated for the selection. You can have as many judges or selectors as you wish. Once the selection is made, participants will be able to upload a digital file of better quality to show it. 4.1. I am new at Movibeta, how do I upload my film? 4.2. What sort of files can I upload to Movibeta? 4.3. How should be your VIMEO setting in the case using a Vimeo link, and how should your YOUTUBE link be in case you are using a YOUTUBE link? 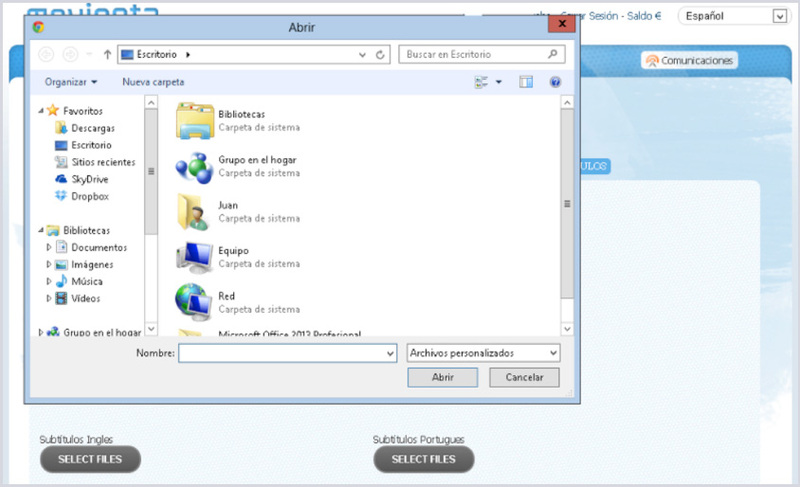 In Movibeta, the first step is to enter with your user and password keys from http://festival.movibeta.com y subir en tu cuenta la película. Once you have your film uploaded into your account you may click on register and every film festival matching for film requirements will be shown. Filters apply on gender and theme, duration, and final date of production. The search engine can also filter the film festival applying admission fees, or the film festival that have a economical prize. 5.1. If I have already submitted a film to a festival, do I need to upload the Film to every film festival in which I want to participate? 5.2. How do I know where is my film submited? 5.3. I have a new version of my Film. how can I send this new file to the film festival in which I am currently participating? 5.4. Does each festival require that I submit different film information about my film? 5.5. How can I cancel one submission to a film festival? Next Select the film that you want to submit to a new film festival and click on REGISTER. The film festivals, where it is not registered yet, will be shown. Choose the film festival you want for your film. You may choose more than one. 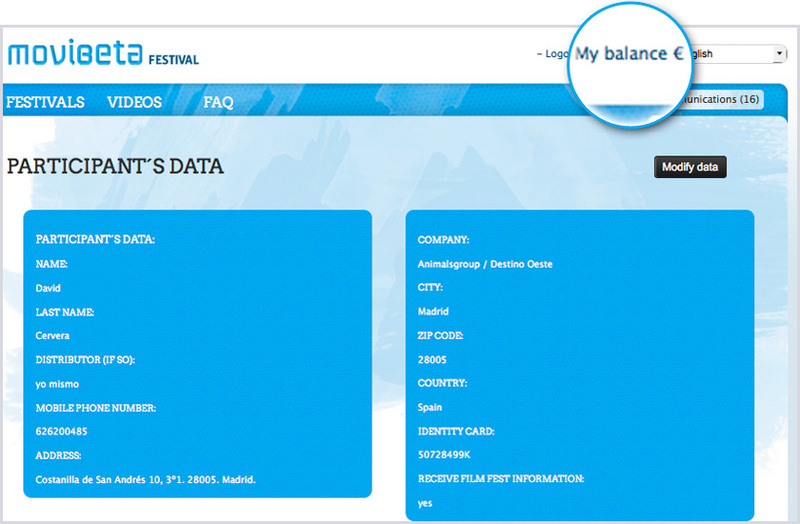 Once you have selected a film festival, you need to accept the terms and conditions. Select a category or folders within that film festival. Click on Next at the bottom right corner of the page. Click on “Participate In” and you will see the list of festivals in which your film has been submitted. Go to your Films select the old version film. Click on MORE and UPLOAD A NEW VERSION will be displayed, your new version film will be actualized at any film festival where you submitted. 1. 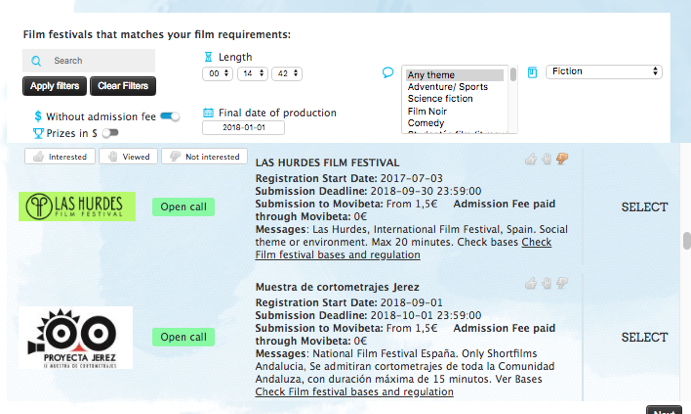 Festivals in which both, the film and the film information, are hosted with us: In this case you need to fill in the require fields by the festival only the first time you submit your film. 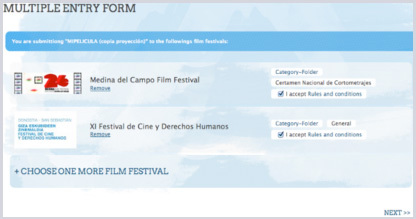 If you submit your film to a second film festival and further info is required, a warning red dot indicating incomplete information will be displayed (2). You can always edit presskit and information about your film by clicking on the row with the name of your Film and the link that reads DATA. 2. Film festivals whose films are hosted at our server and the film information data are hosted at the film fest home page. On our home page, they will indicate: "Compulsory to register documentation first at http://www. the chosen film festival. 6.1. In case I am selected by a film festival, How can I upload my higher quality copy? 6.2. Who will see my Film? 6.3. When will my file be erased from the server? 1) Upload your projection copy to your account to do so click on Upload a new video. The files that are projection copy will appear in your account with a distinctive so that you do are not mistaken by them. Any further actions must be taken between directors and the festival itself. See history will show you the films where your film has been submitted. Film festival needs to agree in showing you that viewing information. If you have any doubt write us to info@movibeta.com, we are happy to help. Films will be hosted in a private server owned by Movibeta during the period agree with the film festival. Once the film festival has been closed, (usually no longer than 6 months) all films and information are erased from the server for that film festival. If your film is submitted to any other film festival will be still available at your account in my Films. If your film is submitted to any other film festival will be still available at your account in my Films. First you should upload the film and then you should add the subtitles. 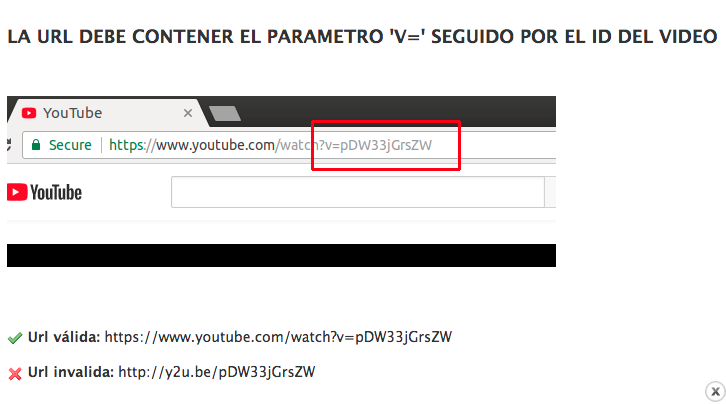 For each language you want your film to be subtitled at, you need to upload its ".srt" file. 1.- Go to "Películas" screen. 2.- If you want to subtitle a film, click on “film information”. 3.- Click on “film information”. 5.- Click on the target language you want to subtitle into. 7.- You already have your film subtitled in the language you chose. 8.- If you want to subtitle in another language, you should repeat the previous steps. 8.1 How do I know where is my film subbmited? 8.2 How do I know where my film has been evaluated? 8.3 How does the film festival contact me? 8.4 How can I contact the film festival? We recomend you use Movibeta messages to contact the film festival.